Cleaning chrome is simple with these recipes for homemade chrome cleaner and homemade chrome polish. Step 1: Combine the ingredients together in a spray bottle, shaking well to mix. Step 2: Spray on and wipe off. Rinse if necessary. 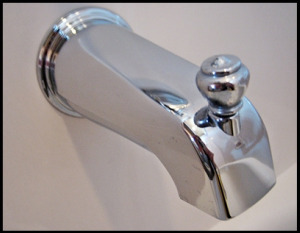 You must use very gentle cleaners for chrome, because it is not a solid metal but merely is plated onto the surface of the object, such as your bathroom fixtures. You can also use a spray glass cleaner for routine cleaning for chrome. Chrome is found not only in your bathrooms, for example, but also on certain car parts. Tough to get out spots, like paint and tar, can get on chrome on your car. You have to be careful how you get these off, because the chrome plating is so delicate. For these tough to get off spots try applying paint of lacquer thinner sparingly to a clean cloth, and wipe away the spot. Place a very small amount of whichever oil you choose (a few drops at most) onto a clean nonlinting cloth and rub the oil onto your chrome to give it a shine. Hint: If you don't want to use oil another possibility is to use a non-abrasive toothpaste. Rub the toothpaste onto the chrome, gently, and wipe off to give it a pretty shine.